This topic describes the Endpoint Manager Web console and how to use it. Remember that if you don't see a tool, you probably don't have rights to view it. These rights are determined by the access rights and device scope assigned to you by the Endpoint Manager administrator. The title bar displays the device you are logged in to and the user you are logged in as. It includes a help link that opens help topics for the Web console. The toolbox shows available tools, grouped under headings. Click the chevrons next to a heading to expand or close the group. The right side of the console has variable contents depending on which tool is in use. If this area is divided, the top part is referred to as the tool pane and the lower part as the action pane. The tool pane shows the basic elements of the tool you've selected, and typically in the action pane you will either select actions or view the results of the task you are doing. You can resize the panes and columns of the Web console. You can also expand or reduce the size of toolbar elements so you can view them better. NOTE: For dialogs and windows to display properly, the Endpoint Manager Web site must be added to the allowed list of the browser's popup blocker. The My devices list is the main window that is displayed when you start the Web console and is the starting point for most tools. It contains the following groups and sub-groups. In addition, depending on your access rights and device scope, you can create your own groups for easier management of devices. Right-click a device in the Devices list to view available options for that device, such as Ping, Remote control, and Target. To select multiple consecutive entries in a list, click the first item, press and hold down the Shift key, and then click the last item. To select multiple nonconsecutive entries in a list, press and hold down the Ctrl key, and then click each item. Double-clicking a device in the All devices list opens a full device inventory window that displays all inventory information for the device. NOTE: The My devices list also includes Virtual Hosts OS groups. The All devices list shows the devices for the currently logged-in user, based on the user's scope, in a flat list (no sub-groups). When connected to a particular core server, the administrator can see every device managed by that core server. Product users, on the other hand, are restricted and can only see the devices that reside within their assigned scope (a scope is based on either a database query or a directory location). Devices running product agents (Standard management agent and Inventory) automatically appear in the All devices list after they have been scanned into the core database by the inventory scanner. Typically, this scan takes place for the first time during initial device configuration. Once a device is scanned into the core database it is considered to be a managed device—it can now be managed by that core server. Because the All devices group is populated automatically via an inventory scan, you may never need to manually discover devices. However, to discover devices not already in the core database (or to move unmanaged devices to a managed devices group), you can use the device discovery tool to scan the network for devices. The All devices group provides the following information for each device. To sort a column, click on its header; click the header again to reverse the sort. Double-click All devices to open the list. Name: The device host name, such as the Windows computer name. Health: The health and availability status of the device. This can be Normal, Warning, or Critical. Agent: The current agent running on the device. Device type: Displays the kind of hardware on the machine (Intel AMT, IPMI, ASIC, or IPMI Advanced). Operating system: The type of operating system the device is running. Up since: The date and time the device has been operating without interruption (in the time zone of the database). When no agents are installed on a device, the name and IP address are the only columns that contain information. In some instances, the operating system will also display. ID: The identification number of the device. This number is determined by the sequence in which the device was added to the All devices list. For more actions available in the Properties pane, see About the Properties tab. The My devices list shows groups of devices created by the currently logged-in user. My devices groups are not visible to, and can't be used by, other users. 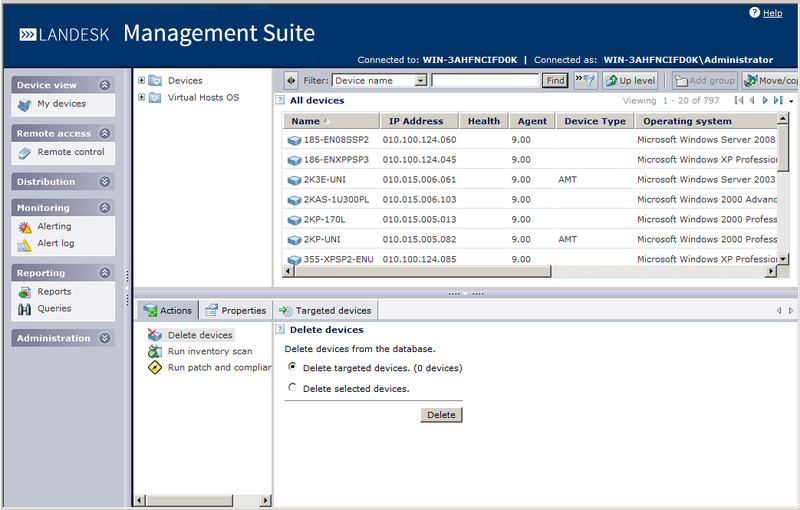 The Public devices list shows groups of devices that have been created by a user with Administrator rights. They are visible to other users. The Virtual hosts OS list shows VMware ESX servers that are configured as virtual hosts, that have been discovered by selecting the Virtual hosts option in a device discovery configuration. When you click Virtual hosts OS or any sub-groups in the tree view, the hosts are shown as end nodes in the device window. When you click a host name in the tree view, the host is a container and the virtual machines running on it are displayed in the device list. Device icons in the All devices list show the current health status of each device, if the device includes an agent with the Real-time inventory and monitoring option selected. You can update the health status for devices one at a time as you select them in the My devices list by clicking the Refresh toolbar button. NOTE: These icons require at least a 16-bit color-depth setting to display correctly. If the icons in your console appear out of focus, change your color settings in the Windows Display Properties. Shortcut (context) menus are available for all items in the console, including groups, devices, queries, scheduled tasks, scripts, and so on. Shortcut menus provide quick access to an item's common tasks and critical information. Remove from group: Removes the item from a user-defined group. Ping device: Verifies the device is responding. Tracert device: Sends a trace route command to view a network packet being sent and received and the number of hops required for the packet to reach its destination. Scan device: Scans the device for vulnerabilities. Click Start scan. Remote control: Launches the remote control window, allowing direct access to the selected device from the console. The help does not cover every console item's shortcut menu, but we recommend that you right-click any item to see the options that are available. Tools are grouped in the toolbox into sections, with headings such as Device view and Remote access. Click the chevrons next to a heading to expand or close the group. An administrator sees all of the tools in the toolbox. Other users will see only the tools (features) that are allowed by their assigned rights. For example, if a user doesn't have the Reports right, the Reports tool doesn't appear in the toolbox. My devices: View device properties, run scans, and target devices. Remote control: Remotely control devices and exchange files with them. Distribution: Distribute software packages, use custom scripts, schedule distributions, and create software distribution tasks. Scripts: Create and manage scripts. Directory manager: Locate, access, and manage devices in other directories via LDAP (the Lightweight Directory Access Protocol). Scheduled tasks: View all tasks that are currently in the scheduled or completed. Alerting: Configure and schedule alert rulesets to notify you with device monitoring data. For more information on alert rulesets, see Alerts and monitoring overview. Alert log: View alerts sent to the server. The log is sorted by time with the most recent alert at the top. For more information on logs, see Alert logs. Reports: Manage predefined service reports. Queries: Create and modify queries to the database to isolate specific devices that meet your criteria. Preferences: Create custom inventory attributes and view licensing information. In the My devices view, you can quickly view information about a device by clicking the device in the list and selecting Properties in the action pane. More detailed information about the device is available in its inventory data. View inventory data in the All devices view by double-clicking the device, or by selecting the View inventory tab in the Properties pane to open the full Inventory window.